On my recent trip to visit relatives in Vietnam my cousin Sieu Hui made Ah Ma's fried rice. This is how Ah Ma likes her fried rice. It is made with rice, shrimp, taro and Chinese broccoli. 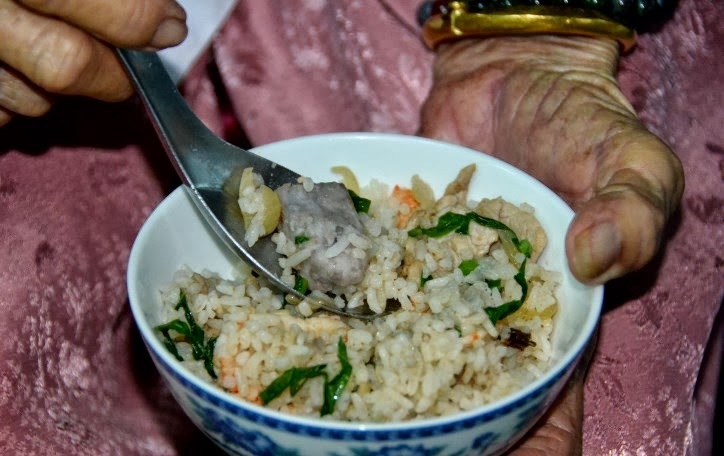 People add many different ingredients to their fried rice, however, Ah Ma's special ingredient is taro. Tonight I decided to add some Chinese sausages since I have a few left in my refrigerator. I must tell you this dish turned out amazingly tasty! 1) Cook the cubed taro and whole sausages with the rice either in a pot over the stove or in a rice cooker. Once the rice is completely cooked, remove the sausages and dice them. 2) Heat oil in a large pan or wok over medium high heat, add the diced sausages, garlic and shrimp. Saute for about 2 minutes or until the shrimp is just cooked. 3) Add the broccoli leaves, saute about a minute until the leaves are wilted and cooked through. 4) Add soy sauce and salt and saute for about a minute. 5) Decrease heat to medium low. Add the rice with taro a little at a time, mix all contents until well blended. Continue to add a little more rice with taro until all the contents are mixed together. *The smaller shrimp are a lot less costly and this is a great recipe for them. *I believe that fried rice is made as a way to use up old rice, at least this is one of the ways old rice is used in my family. If you don't have day old rice then you can just make it using freshly made rice. If you are making the rice then use a little less water so that the cooked rice is less wet once cooked. Dryer cooked rice will make better fried rice.